Moses - "Let my people go," was the cry of a lowly Hebrew to the Egyptian Pharaoh. Pharaoh refused and God hardened his heart to the point where he nearly brought his own kingdom to ruin. The life of Moses is known to us only from scripture. However, the first century historian, Josephus, who had access to ancient records that are now lost, filled in many gaps. How much is accurate, we'll never know. Moses is regarded as the author of the first five books of the Bible, both by Jews and Christians. 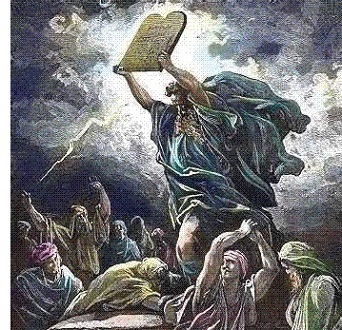 The Torah (or Pentateuch) laid down the Law for God's people (see below), and thus, Moses is considered to be possibly the most important figure in Judaism. What's more, he lead the Hebrews out of Egypt and into the Promised Land. According to Josephus, his birth was foretold by an Egyptian soothsayer as the "deliverer" of the Israelites. Pharaoh attempted to prevent this by killing all the male babies in Gohsen by throwing them into the river. But Moses' mother saved her son by placing him in a reed basket and sending him down the Nile where he was, ironically, found and raised by Pharaoh's daughter, as she was childless. Nothing of his childhood is known, but Josephus says he distinguished himself while in the service of Egypt, particularly in war with Ethiopia. But one day, after he killed an Egyptian, he fled to Midian. It was here that he encountered the God of Israel, Yahweh, for the first time. God commanded Moses to return to Egypt and free the Hebrews. After Pharaoh refused to free the Jews, God sent a series of plagues that were instrumental in changing Pharaoh's mind. What followed was 40 years of wandering in the desert before the Israelites entered the Land of Canaan. The dates of Moses' life and the Pharaoh with whom he contended are not known for sure. Some scholars place him as early as around 1600 B.C., which would put his life at the time of the Hyksos. Others as late as the reign of Ramses II. Interestingly, Josephus refers to Pharaoh’s daughter as Thermuthis, which may put her in the family of Thutmose; although Jewish tradition assigns her the name Bithiah.